I would like to report my impressions about the “Nyx” Synthetic Quilt which is expected to be released from March 2014 to the people who will consider using or have an interest. The Nyx has been tested over a year on several occasions along with the wild fields. 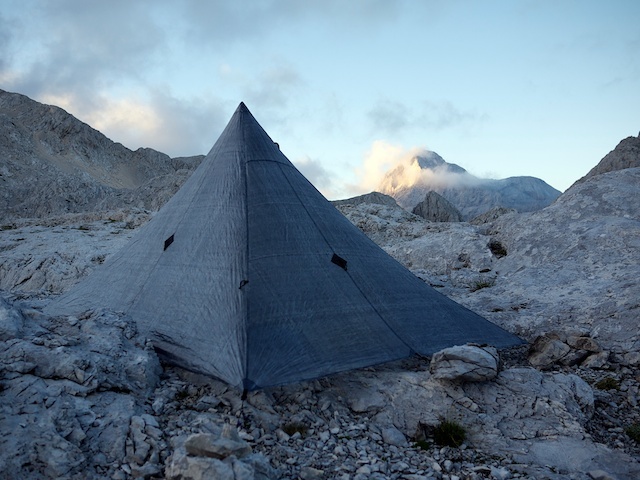 We have been wrestling to develop the Nyx for about two and half years as a quilt which is able to use in 3 seasons, and now would like to inform the details and the possibility including the comfort in the use of the Nyx in the situations about what kind of weather conditions, how degrees of the temperature, how altitude and what condition of the ground through this report with hoping that could be helpful. Though, I must say in advance that this report is based on my personal impressions of the Nyx, so that there might be some differences of the impression depending on the person how to feel coldness or comfort. First, introducing the materials and the specification of the Nyx. Quantum GL is one of the most advanced fabric and is a natural evolution of the award winning Pertex Quantum fabric. Precisely woven using incredibly fine 10 denier or less yarns, these nanolight at less than 25 g/m2 (0.75 oz/yd2). 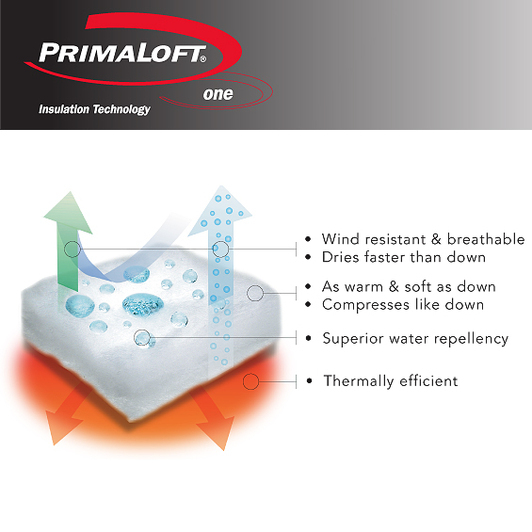 PrimaLoft ONE is the highest performing insulation on the market for warmth, water resistance, softness and compressibility. 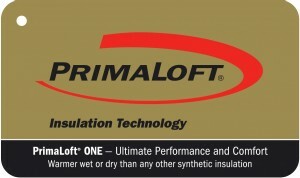 PrimaLoft ONE is an ultra-fine microfiber insulation that is as warm, soft and lightweight, and is warmer wet or dry than all other insulations. Ultra-fine fibers form tiny air pockets that trap body heat and keep the cold out. The result is immediate warmth without the bulk. 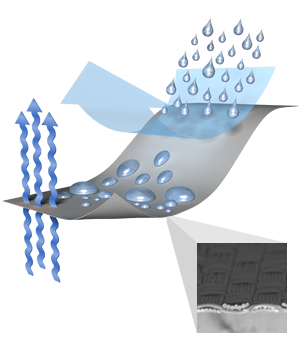 PrimaLoft ONE Microfibers are engineered for permanent water resistance and create tight surface tension that resists moisture penetration, resulting in an insulation that dries faster than goose down. Ultra-fine fibers mimic the compressibility of goose down and are breathable, allowing moisture vapor to be transported through the fibers and away from the skin. 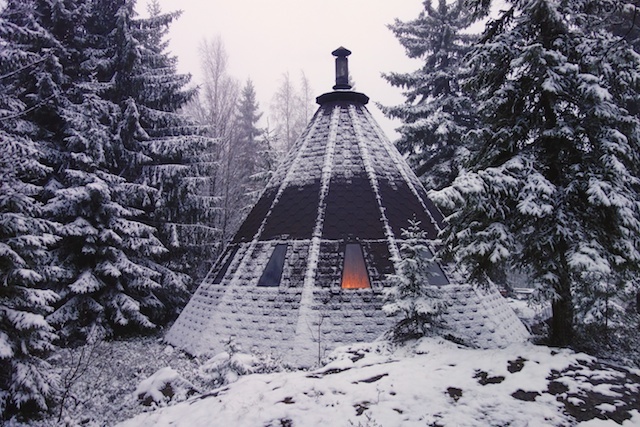 Clo is used by insulation companies as a standard measurement of warmth. Like most imperial measurements such as the yard, foot, or inch, the origins of a clo value are quite curious. At its origins, one “clo” represent the amount of insulation required to keep a man in a business suit comfortable in an indoor room at 70 degrees F. Not very specific, right? In the modern world, one “clo” is the comfortable temperature of a clothed resting person in a room at 70 degrees F. The clo value is mathematically related to the R-value, so there is no longer an overarching generality for the measurement. 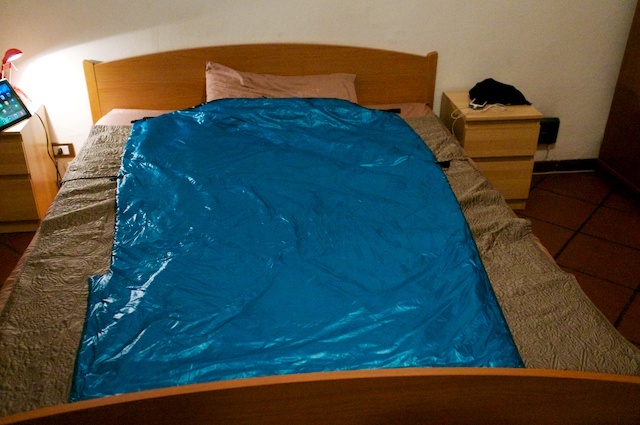 PrimaLoft ONE has a dry clo of 0.92 clo/oz/sqyd and a wet clo of 0.90 clo/oz/sqyd – relative to one “clo,” those figures are very close to that of a clothed resting person in a temperature-controlled room. 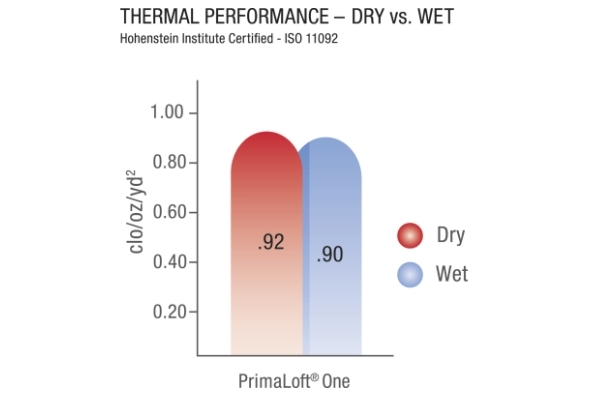 As the graph shows, the results of clo are quite high value of 0.92 in the dry condition and 0.9 even in the wet condition in the PrimaLoft ONE, which means the PrimaLoft ONE reduces its performance only 2% in thermal insulation in spite of the wet condition. So I must say that this is a valuable quality of the material. To fasten itself by 2 of the adjustable elastic bands with thin buckles. The loops with shock cord which are attached with the adjustable elastic bands on the both sides are able to fasten a mat. To open/close the foot box part with plastic snap buttons and the bottom part with shock cord and toggles. To fasten around the neck part with shock cord and a toggle. *The estimated size of user is up to180cm in height and 80kg in weight. The Nyx is just fit for my size of 178cm in height and 76kg in weight. 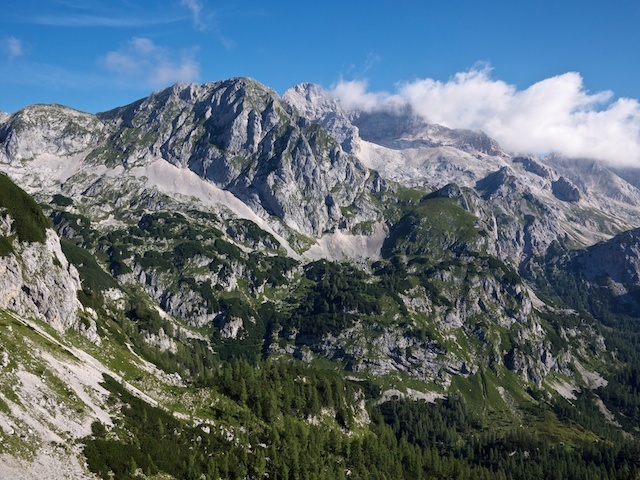 The weather at that time of Slovenia Julian Alps was similar to the Japan North Alps in summer. 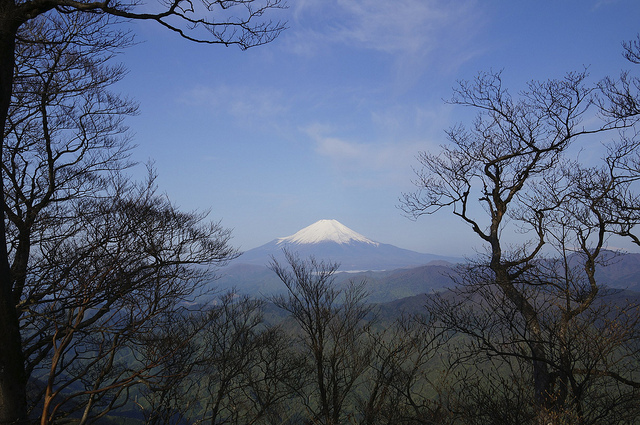 A few differences between them were there was drier because the tree line is lower as well as less amount of rainfall than the Japanese mountains. 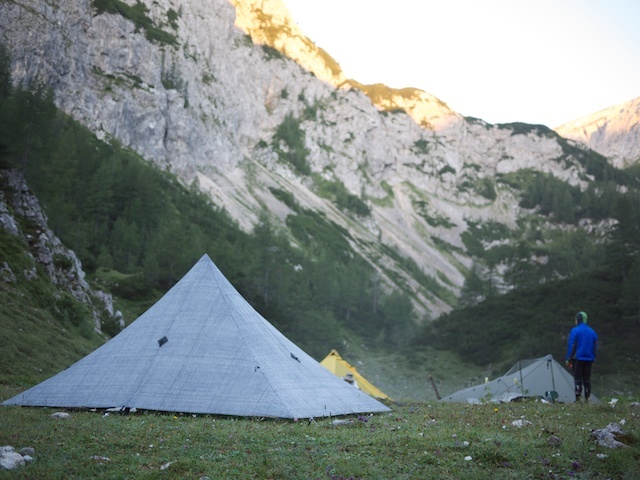 In the Haribarice Plateau of its altitude 2,300m where became the low temperature, I had to pitch the Khufu CTF3 black with using rocks around there because the stakes were unable to work on the ground with almost rocks. So that the place had a temperature difference that it was 15 degrees C in the day time then became 6 degrees C before the dawn even in the mid summer. 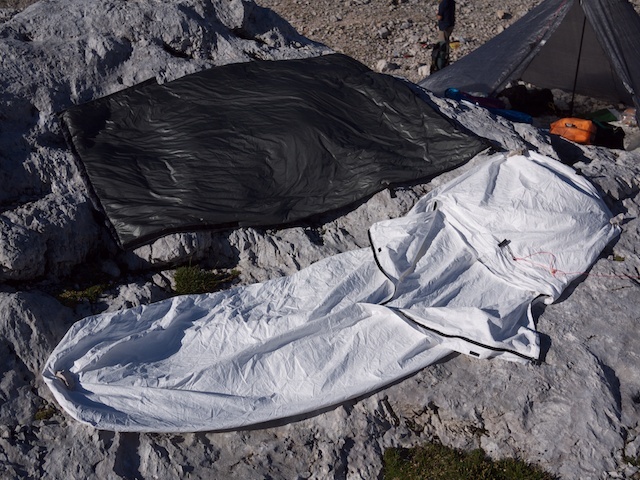 My sleeping system was that the Z-lite long foam mat directly on the rocks then Phenma Bivy Tyvek combined with the Nyx. I was wearing thin wool socks (Patagonia light weight), synthetic pants (Patagonia Gill zip-off Pants), thin synthetic base layer (Patagonia Capilene 1 Silkweight Crew) and synthetic insulation Jacket (Rab Xenon Jacket) in that layered combination. 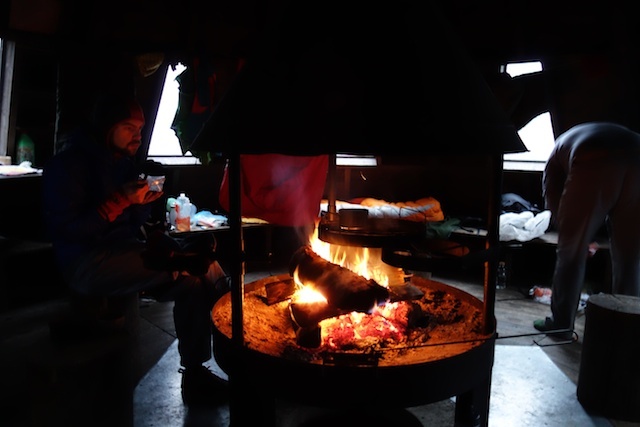 In fact, it was colder than expected, so that one of our crew had to go down to the less cold place in the midnight because of the physically bad condition and maybe from a lack of the sleeping system. However, I had not been bothered to notice that and slept so deeply then happily woke up, even felt hot with my feet then took my socks off. Actually the Nyx I had tested at the time was a prototype which was used PrimaLoft SPORTS as the insulation, but the proper Nyx is used PrimaLoft ONE which is higher spec in its performance than that. Therefore I expected that the proper version of Nxy would have been more comfortable with the condition of the temperature difference. Next I would like to show you the photo which was the camp point of 1,720m altitude. Here was the bottom of the mortar shaped valley, so when the cold air was accumulated it became humid then condensation happened heavily. 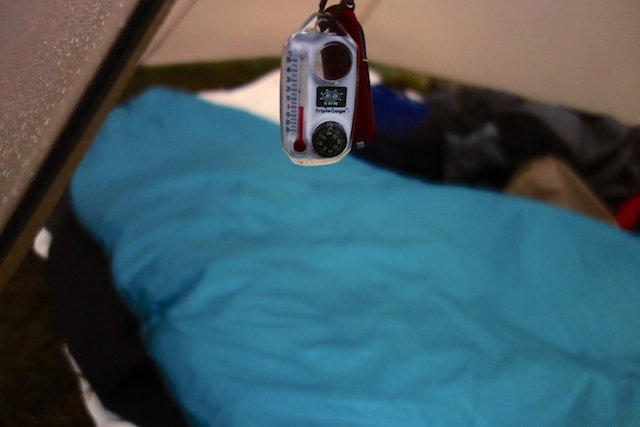 The temperature in the early morning was 8 degrees C, and I could sleep quite comfortably with the same sleeping system as previous night. 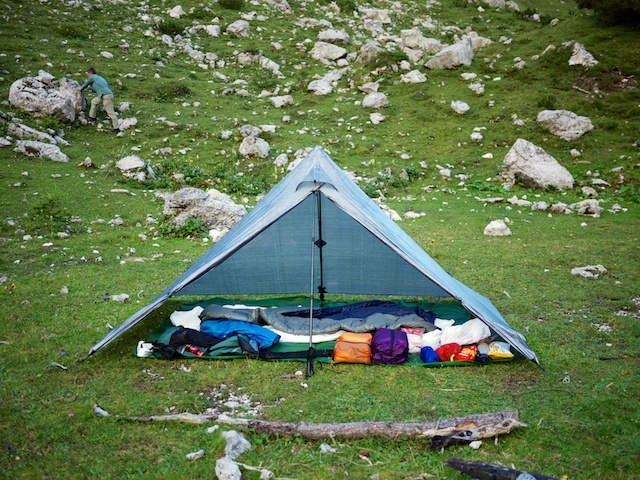 To test the performance of the water repellency in Partex Quantum GL as well as the water resistance in the synthetic quilt, I did not use Bivy, then I could have got the result that the Nyx was for me to satisfy enough in its functionality even a bit wet because of the condensation of the shelter. TANZAWA in the early May, here still often became below freezing, so it was 0 degrees C in the early morning. I could see the condensation became freezing at the surface of the shelter, and the water I had prepared became ice on its surface. 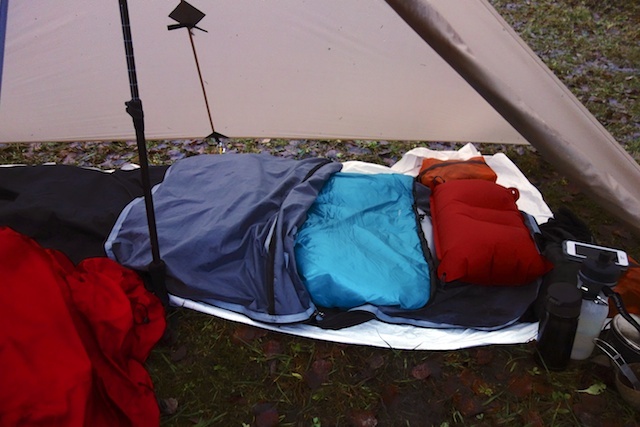 The sleeping system I used at that time was Hypnos mat, Pneuma eVent Bivy and the Nyx quilt. I was wearing mid-thick wool socks (Patagonia mid weight), synthetic pants (Patagonia Gill zip-off Pants) plus down pants (WM Flash pants), thin synthetic base layer (Patagonia Capilene 1 Silkweight Crew ) and fleece with a hood (Patagonia R1 Hoody) and synthetic insulation Jacket (Rab Xenon Jacket) in that layered combination. In addition, my dog Rocky was with me, so I had prepared a mat and a fleece blanket for him. 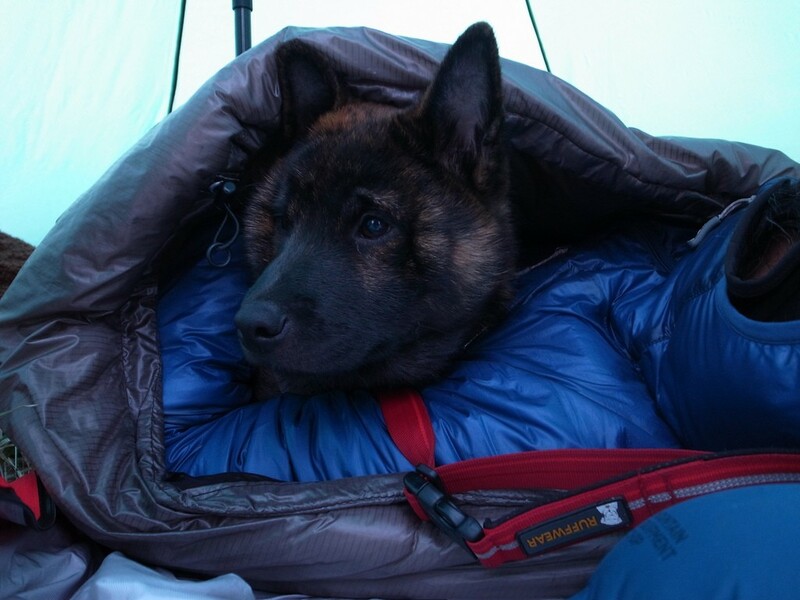 Then he slept with them for a while but came to join me inside the quilt because of too cold or maybe too nervous as the first camp for him. I had assumed that the lowest temperature with the Nyx can be used was 5-6 degrees C, then that time it became below freezing, however, I could sleep comfortably without feeling coldness with the layered combination I wore. 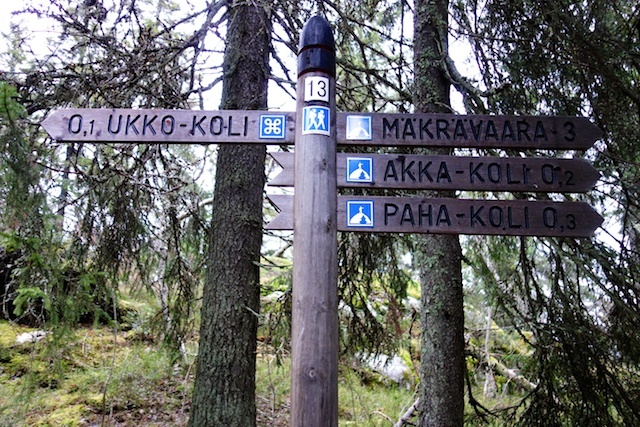 It was almost rain and snow whole of the hiking in Finland, which for me was a good opportunity to test the performance of the Nyx. 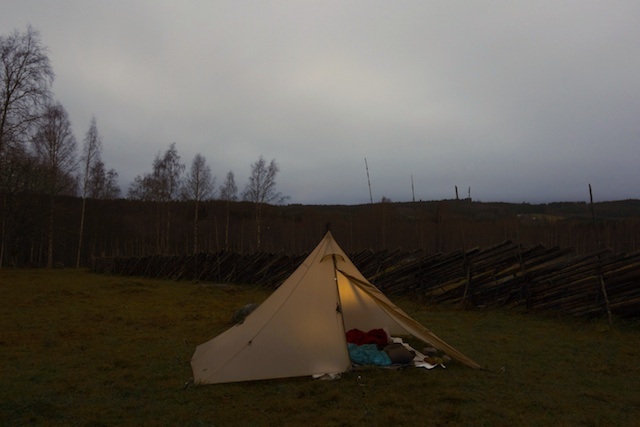 As I forecast the temperatures through the days of hiking in Finland were about 5 to 0 degrees C with wet and cold snowing rain, which was the lowest limit on the use for the Nyx I had set. Here was the hut I stayed. I was impressed with this very functional and designed hut, which also allowed to make a bonfire inside. There were many firewood prepared in a woodshed located nearby, so you can cut them for use, very comfortable. 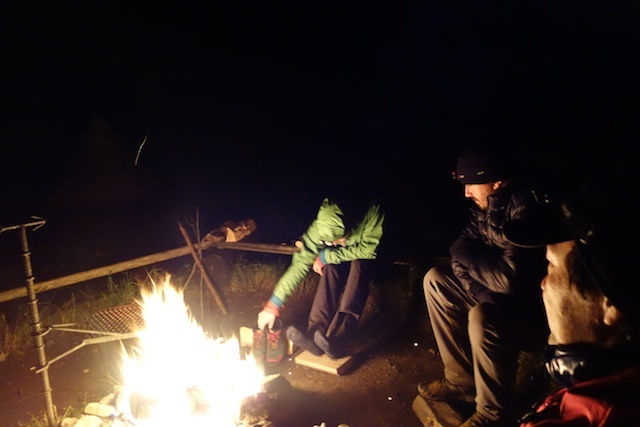 As the photo, you can enjoy eating and sleeping around the bonfire warmly, and also dry your wet stuff. 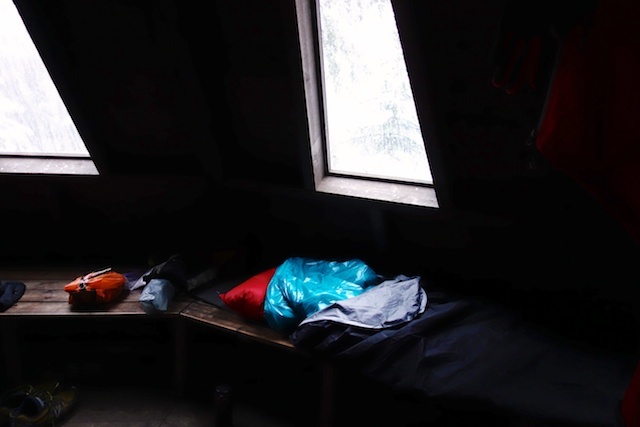 Outside was snowing from rain, so the temperature went down along with drawing snow lay, however, I could feel warm inside the hut. Then it became 0 degrees C soon after the bonfire finished around the midnight. 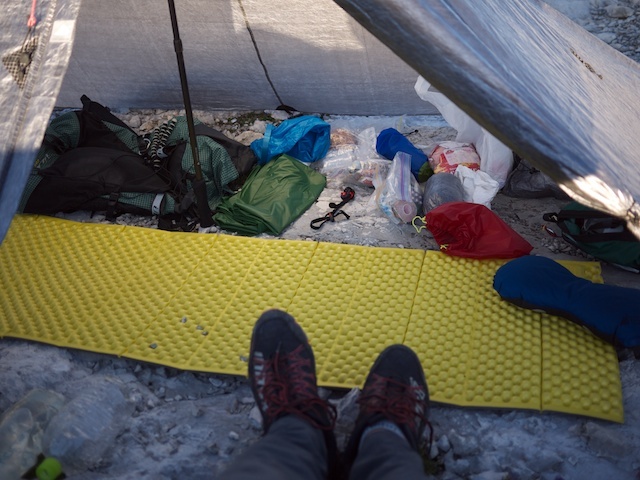 I was wearing water resistant socks (Seal Skinz Mid-weight), synthetic pants (Patagonia Simple Guide pants), merino wool half zip (Smart Wool Half Zip) and synthetic insulation Jacket (Rab Xenon Jacket) in that layered combination. I woke up with a little coldness especially on my toes in the midnight because the socks were a bit wet and it was only the synthetic pants I wore below my waist. I was tired to change them so tried to keep sleeping through the night, then naturally went asleep again until the morning. I wouldn’t have felt the coldness unless the socks weren’t wet. Of course I should change if necessary. 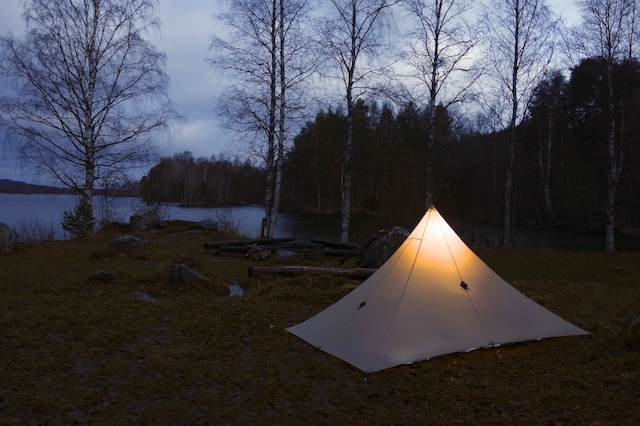 And better to wear base layer bottoms or insulated pants in the temperature of 0 degrees C.
Next, I would like to introduce the aspect of the lakeside campsite. In spite of the exquisite scenery, there was a very bad wet condition with water pools on the ground by rain and snow through the days. First I used a Tyvek sheet to cover the wet ground, then put a thin foam mat over it. 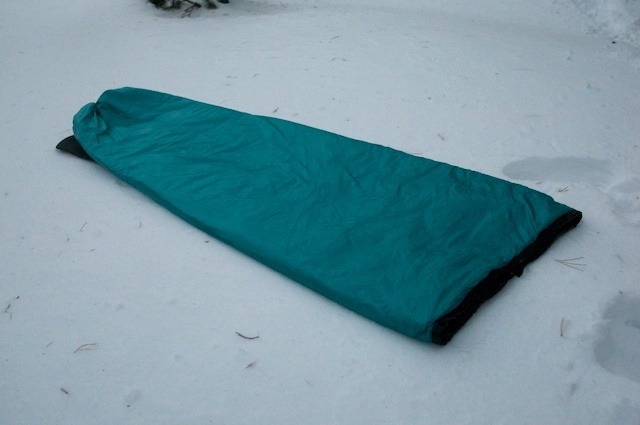 Next, NeoAir XTherm was come over the mat, then Pneuma Bivy eVent and the Nyx. 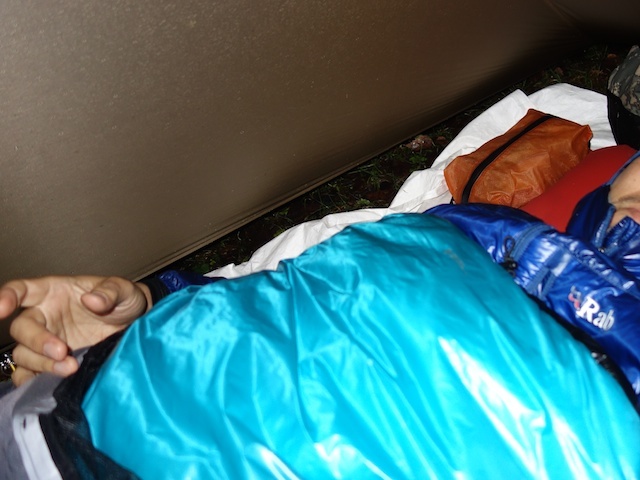 I needed to wear both synthetic pants and synthetic insulated pants there, and was quite comfortable with the Nyx which was protected by the Pneuma Bivy eVent from the condensation heavily happened. It had been raining intermittently after that. Here was the campsite on a low hill. 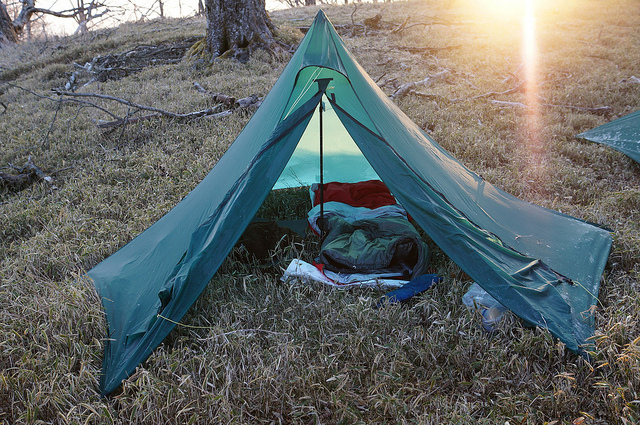 The temperature went down to 0 degrees C around the dawn, so the condensation was heavy and the ground was wet, however, I could sleep with the same sleeping system and the clothes. 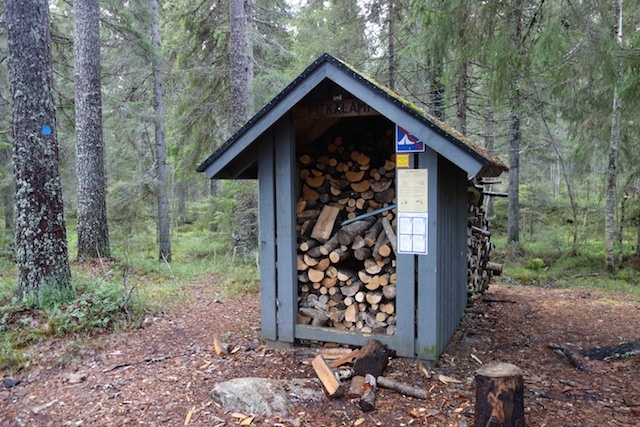 Dry up my socks with the bonfire.There are many woodsheds in campsites and break points in the national park hiking routes in Finland, so we could make a bonfire like the photo. As I have shown through my experiences and the test results, the Nxy could be used for almost 3 seasons from Spring to Autumn in several fields. I personally concluded that it is possible to use the quilt down to 0 degrees C with carefully selected layering wears for that occasion. We set up the appropriate limit temperature for the use in the Nyx is 5 degrees C, which considers the differences of individual feeling of coldness. So that I think for women it should be about 10 degrees C.
The Nyx is structured to fasten itself by 2 of the elastic bands with the thin buckles on the upper part of the back, to open/close the foot box part with the plastic snap buttons and the bottom part with shock cord and toggles. Therefor there are various ways of the use such as to open only the bottom when the upper part is closed, or to be fully open, which makes the way of the use flexible depending on the occasion and weather condition. 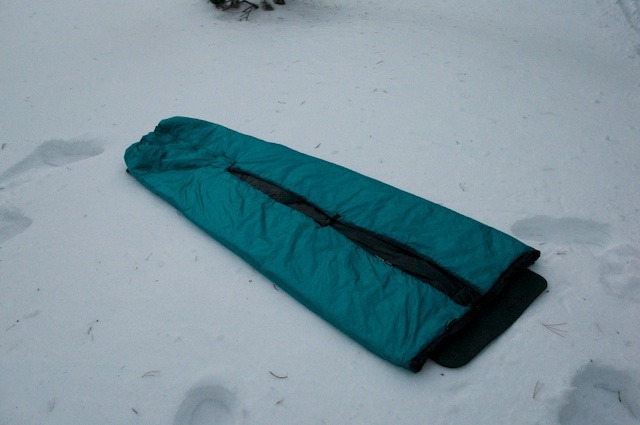 In addition, there is a way that the Nyx can be used as a top quilt to raise a down sleeping bag’s limit temperature of use, as I rented the Nyx to a crew whose down sleeping bag was not warm enough to the situation while field testing in Switzerland. And furthermore, one possibility of the use like the photo as a Futon in the hotel as well as in the car.